ICP/MS analyses being performed in a clean room. ICP-MS is the accepted and most powerful technique for the analysis and quantification of many elements in liquid or solid samples due to its speed, precision, and sensitivity. Do you have a chemical analysis problem you want help with? We can help with a custom analysis and interpretation of the results. For a larger, more complicated analytical problem involving a significant research element it may be more economical to support an MSc student to undertake the work. The research may even qualify for subsidies. Running your own analyses on our analytical equipment is possible (and at a reduced cost) in some circumstances – please contact us to discuss. All external reports which include interpretation of data are peer reviewed. 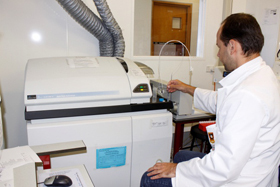 We have access to an extensive range of chemistry research equipment and facilities which may be used in your research. The available instrumentation is divided into the categories below. Straightforward access can usually be arranged to a wide range of other instrumentation (for example, instrumentation and facilities related to the Biological Sciences, Earth and Ocean Sciences, Physics, Engineering, Mathematics and Statistics). Access can also be arranged to facilities housed at other Universities and the closely-related external institutions (such as MIRINZ, NIWA, AgResearch, Landcare, and various other CRIs). External clients please contact the Chemical Services Unit staff. Internal clients, please contact your academic supervisor. Find and make contact with the staff in the Chemical Services Unit. For the latest equipment and analytical costs for external clients, please refer to the Chemical Services Unit Fee Schedule.